........................for studies including: • Crack nucleation and propagation in structural materials. • The efficiencies of Fuel cells, Solar cells, Optoelectronic, Ferroelectric and Piezoelectric devices. • Thin Film Growth, including thermal strains and misfit dislocation numbers. using the software package CrossCourt developed to the Wilkinson Meaden Dingley method by Graham Meaden and Damian Dingley of BLG-Vantage. This - HR EBSD - is some 80 times more sensitive than conventional EBSD. The full disortion tensor is calculated and mapped including compression/tension, shear and rotation. Maps of Geometrically Necessary Dislocation density are calculated by the software. This software is EBSD-hardware-supplier independent, aiming to be widely compatible, but does require good resolution images as a starting point for anaylsis. (Ask for details.) This new technique is growing both in capability as it is further developed, and in interest as the applications in materials science become better known. 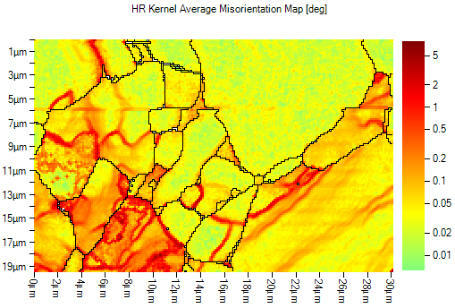 In the above-left map (Standard KAM) it may appear at first sight that the small green patches show a high resolution. In fact these are aberrations resulting from the standard Hough transform method. On the right-hand side we see new structure such as the detail of low-angle grain boundaries.